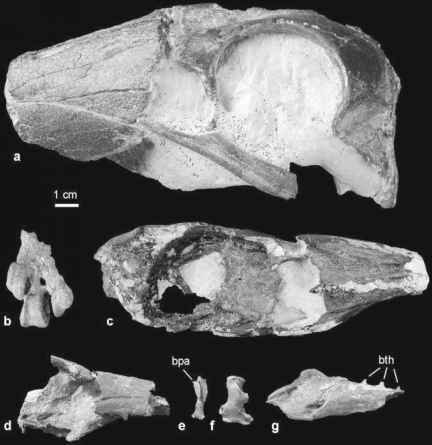 This taxon includes a single species, Xenerodiops mycter Rasmussen et al., 1987, from the early Oligocene of Egypt, which was established on the basis of a rostrum and a tentatively referred humerus. Whether these bones indeed belong to the same taxon cannot be definitely shown, but as noticed by Rasmussen et al. (1987) there exists a possibility that they do. X. mycter was slightly smaller than the extant Abdim's Stork, Ciconia abdimii. The humerus shows some overall similarity to that of extant Ardeidae, but the pneumotricipital fossa lacks pneumatic openings (Rasmussen et al. 1987). The rostrum exhibits weak lateral furrows, which occur in many of the taxa discussed in the present chapter, and a completely ossified ventral surface. Humerus morphology also suggests that X. mycter is probably most closely related to the birds united here, but its phylogenetic affinities are best considered unresolved. I agree, however, with Rasmussen et al. (1987) that this species represents a distinctive taxon, and it is to be hoped that future specimens shed more light on its relationships.